Islam News Room - Islam "Railroaded" Again! The Hejaz Railway was built 100 years ago to carry pilgrims from Istanbul to Medina but it was blown up by Lawrence of Arabia during World War I.
Stretches of the line are still used today by passenger and goods trains with engines and carriages from another era. 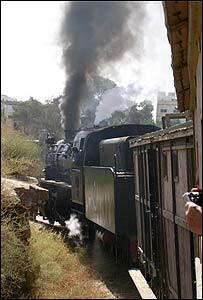 My first encounter with the Hejaz Railway was in clouds of steam along with a pungent smell of hot grease, at Kadem station in Damascus. 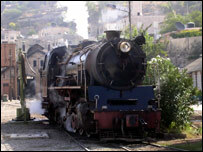 A veteran steam locomotive built in 1914 chuffed past, hauling a goods train towards the Jordan border. From the driver's cab, two soot streaked faces leaned out to see the iron road ahead. It was like stepping back a century in railway history. But I had to remind myself that this was not history, this was now! The engineer in charge of the 100-year-old maintenance sheds (two huge stone buildings full of rolling stock and engines) pointed to the oldest locomotive in service, built in Germany in 1898. "Just one of 11 steam locomotives in service," he told me with obvious pride. "If the 60-year-old diesels break down," he added, "we use steam for the passenger services as well as goods trains." I walked through a graveyard of abandoned rolling stock and a number of locomotives that were gently falling apart in sidings overgrown with grass and shrubs. And what I was looking at were the original carriages and engines that made up the first pilgrim trains in 1908. It had rifle slits in the sides from which guards on the train could ward off attacks from Bedouin tribesmen on the train's four-day journey through the desert to Medina in what is now Saudi Arabia. 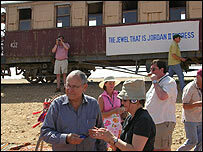 In southern Jordan it is a very different railway. Robbed of its rails and sleepers, the embankment stands proud of the desert, like some sort of natural sculpture that has always been there. The embankment makes a good road until it stops abruptly at a yawning gap where a bridge was washed away by a flash flood perhaps decades ago. On the Saudi stretch of the line there are steam engines that were abandoned after the end of World War I. One was in Medain Saleh, a big station along the line in Saudi. 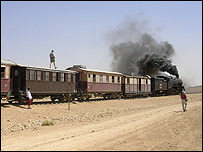 The locomotive, stripped of every moveable part by the Bedouin, was still in its engine shed waiting for maintenance that should have been done 80 or 90 years ago. The last station in Jordan before the Saudi border is Mudarrawra. Peeping out from behind the pillars in front of the ticket office were eight little children, seven girls and one boy who, in the absence of his father, was the spokesman. He recited all the names of his siblings and told me through an interpreter that they had lived in the station for 10 years and that very few people like us stopped to ask about the railway. I could not find any stations on a branch line in southern Jordan, closer to Amman. The Ottomans had sided with Germany in World War I, so the good quality British coal they used in the locomotives from the mines in Wales was cut off. At one stage fuel was so scarce that the engines were being fed furniture and floor boards just to keep running. As the railway had to burn wood instead of coal, they built this 25-mile-long (40km) branch line into a forest near the Crusader castle of Shubak to collect it. A local farmer confirmed that we were at the forest of Hisseth - or what was left of it. "Over there," the farmer pointed to higher ground some distance away, "you can see tree stumps left by the Ottoman troops." Then the Jordanian farmer accused my interpreter and me of treasure hunting. "We couldn't even find the railway, let alone any treasure," I protested. But the farmer insisted that we open the boot of the car to see if we had spades, shovels and any other incriminating kit. Puzzled, I later consulted an archaeologist in Amman who put his head in his hands and said: "Treasure hunting is destroying long sections of the railway." Ueli Bellwader explained that the holes all around the stations we saw in the desert were not World War I bomb craters but deep holes dug by treasure hunters. "It may sound crazy," he said, "but people really do believe that the retreating Ottoman soldiers buried gold around the stations. "In their frenzy to find it," he said, "they have mechanical earth-moving equipment that is demolishing buildings and stretches of the embankment." And the hunt for the treasure has spawned another profitable sideline for shops in faraway Istanbul. Maps of the railway sell for serious money along with a guarantee that the cross on the map is definitely the place to dig for an Ottoman pot of gold.